The Flash method is one accurate and reliable solution to thermally characterize high conductivity materials at moderate and cryogenic temperatures, or refractories and ceramics at high temperatures. It has been established as a reliable non-contact and direct measurement method in a number of application areas such as ceramics, polymers, metals and refractories. Meanwhile, the demand for high sample throughput and simultaneous improvement of precision has become more and more important. 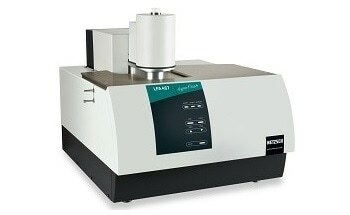 With the LFA 467 HyperFlash as shown in Figure 1, NETZSCH offers advanced efficient technology for determining the thermophysical properties across a broad application range. For further improving the accuracy of LFA measurements, a moveable lens known as ZoomOptics was developed. ZoomOptics enables an optimized field of view of the sample’s surface with software control. The following illustrations will clarify the concept behind this newly implemented device. As shown in Figure 2, in other contemporary LFA systems, the field of view is large enough and fixed to accommodate large-diameter samples. While testing small diameter samples masks are used to reduce the impact of the surroundings. This mostly results in a considerable distortion of the thermal curve in that the detector does not just sense the temperature excursion of the sample, but also detects fluctuations from the aperture stop. Consequently the thermal curve will wither showing a continuously increasing trend or, as depicted below, an extended leveling-off period as shown in Figure 3. The issue is that this kind of distortion cannot be discerned by an inexperienced user. There is a lack in a decline in the detector signal as well as a clear maximum. This is due to the fact that the effects from the aperture stop are super-imposed onto those from the sample. The LFA 467 HyperFlash features the new ZoomOptics, which makes sure that the IR signal recorded solely originates from the sample surface and not from any surrounding zones as shown in Figure 4. This enables testing of small and large samples with an optimal sensing area. Contrasting with the previous configuration as shown in Figure 2, the lens has now been shifted for an adequate field of view. The aperture stop cannot produce any noticeable effects on the signal any longer. As anticipated, the thermal curve now conforms to the theoretical model, yielding correct diffusivity values as shown in Figure 5. Between the sample and the detector, a stepper motor actuated lens optimizes the field of view by means of software control i.e. without the need to employ a mask as shown in Figure 6: patent-pending. This circumvents the occurrence of measurement artifacts resulting from aperture stop plate contributions which cause a delayed IR signal on the sample. The example shown in Figure 6 contrasts two Pyroceram measurements; the first (green result, right picture) applied ZoomOptics and the second (yellow result, left picture) did not. In this example, Pyroceram was measured. The theoretical thermal diffusivity of Pyroceram at RT is 1.926mm²/s, a value which is in good agreement with the green result in Figure 6. In the case of the yellow result, a deviation of 38% took place, caused by misalignment of the lens covering both the sample and part of the surroundings. An exceptional feature of the LFA 467 HyperFlash is the optionally integrated ZoomOptics. It makes operation with masks unnecessary, instead simply fading out any signal distortions from the sample’s immediate surroundings. As a consequence, the precision of the test results increase especially for samples with smaller diameters.